As you probably know, selecting an interesting party game for adults is a job that comes with many difficulties. The main reason why such a task is tricky has to do with the fact that not all adults have similar interests and likings. Because we know this a bit too well, we have decided to lend you a helping hand by composing a list of party games that will surely be well received by your friends. So, read on and make your choice. 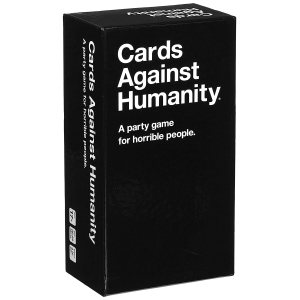 Often described as “a game for horrible people“, Cards Against Humanity is the type of game that everybody enjoys playing. The rules of the game are easy to follow and you can be sure that all adults will find its black humor simply delightful. This 2.0 version contains 100 black cards and 500 white ones, and it is said to include 150 new cards that you might not be familiar with. Yet, before you invest in it, please keep in mind that this game might, at times, involve juggling some politically incorrect assertions that oversensitive people might find offensive. Another similar type of game that involves outrageous and sometimes dirty topics is The Game of Nasty THINGS. This game was developed and is intended for people that are over 17 and that can take a joke. The product includes 256 topic cards, eight pencils, a response pad and a booklet with the instructions/rules. The game can and should be played in large groups of people, which is a reason why it is such a good party game. In order to fully enjoy it, make sure that you play it with people that don’t get easily offended. 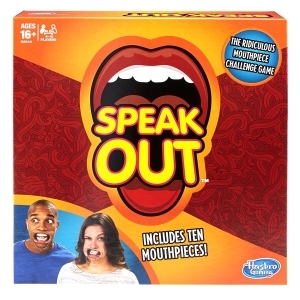 If you are searching for a type of game that will work well for both adults and children, you should consider investing in the Speak Out Game. This game involves using a mouthpiece that makes it difficult to pronounce words the right way. When shipped, this product includes 200 cards with phrases, ten mouthpieces, a timer, and instructions. The game has received plenty of positive reviews, and it has a good price to value ratio. You can also play this game while you are spending quality time with your family. So, give it a go! 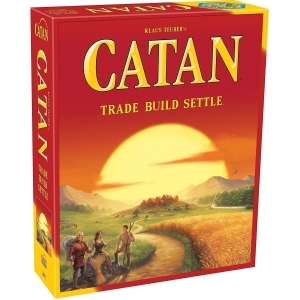 Catan is the type of game that needs no introduction as it has already received the title the “Game of the Century “. Its fifth edition contains a new board, new cards and a set of new rules that will allow you and your friends to have a good time. As expected, the product has countless positive reviews and is very much liked by players of all ages. However, you might want to know that the game is intended for a maximum of 4 players. Also, to complete it, one needs to spend approximately 60 minutes, so it takes a bit of time. 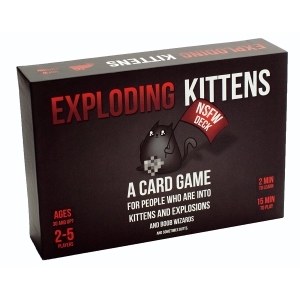 Another game that can be played by people with a dark sense of humor that are a bit sadistic is Exploding Kittens. This NSFW Edition is adult oriented, and it involves topics that make it unsuitable for children. Consequently, this is the game that you should play at your next work party provided that you do not get upset too easily. The product includes 56 cards, a box, and the necessary instructions. 2 to 5 players can play the game at one time, and it is said to be quite fun. Still, if you plan on gifting this to your cat-loving friend, we recommend that you reconsider your decision. 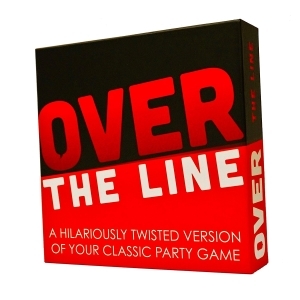 If you and your friends are big fans of charade and Pictionary, the Over The Line Party Game is the product that you should, hands down, purchase. Similarly to the already mentioned games, this one requires its players to either act or draw a card. The twist is, of course, that each of the 350 cards included is, just like the title says, over the line. The product comes with a marker, a dry erase board, and a timer that you might find helpful while playing. 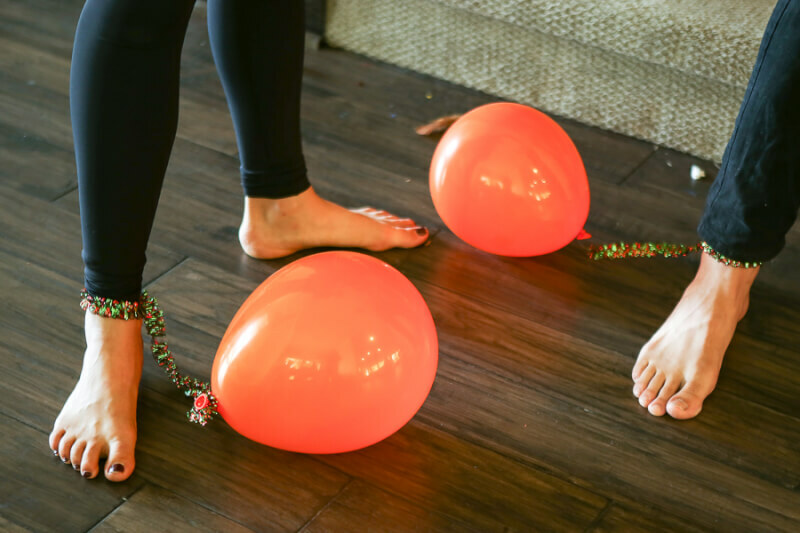 This is a classic party game, and your friends will definitely like it. Last but not least, another game that you should consider is the Adult Loaded Questions. This game is very known among grown-ups, but this 2015 edition is said to contain new questions that will take any party to a new level of fun. The unit comes shipped with 308 such questions and a brand new design that is quite intriguing. Most of its previous buyers warmly recommend it to all those interested. Consequently, it is safe to say that you can’t miss by gifting this game to one of your friends, especially if they have a sense of humor. Making a party plan isn’t all that difficult as long as you have a list of friends and family members that are going to pop by your place to have a bit of fun. If you haven’t had much luck with finding the best party games for adults, we are here to give you a hand. 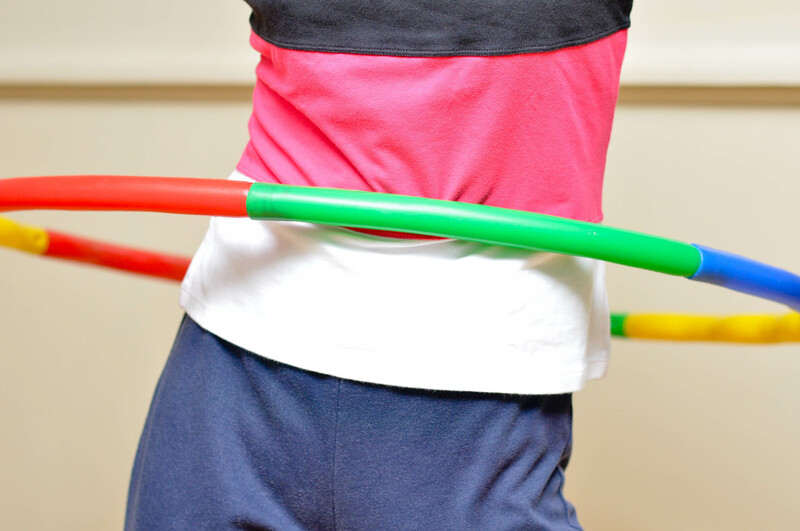 We’ll suggest several that you will want to try out without a doubt, especially as they don’t cost anything. Some games are more interactive and require a bit of technique and commitment, which is to say that you will need to invest some cents into getting them in the first place. In most cases, these are board games to play with friends. Make sure to get an alternative that’s suitable for all of your buddies, because some people have different types of humor compared to others. While the sense of humor of various folks is somewhat macabre, others might be put off by games like Exploding Kittens and Cards Against Humanity. Sometimes, it is quite a good idea to go for classics like The Settlers of Catan. To save you a bit of time, we’ve created a short guide on the best adult games that are available for sale these days. Check it out below. First off, you need to make a distinction between good games for adults and those that are primarily designed for children. It’s true that any parent can play with their kids, but adults have different ways of having fun, which is to say that they might not be interested in the same colorful or shiny objects that might create a good degree of enthusiasm on the part of toddlers, for example. Besides, you need to always make sure that you take your visitors into consideration, which is to say that you should select a game depending on the preferences of those who are going to come by for drinks, coffee, or a snack. Read on to find out more about the factors you have to bear in mind when you’re in the market for party games for sale. One of the first things that should cross your mind is the number of people you are going to receive in your home. If you’re getting the game for someone else, you ought to find out a bit about them so that you understand whether they get visits from their buddies quite often. If they do not, perhaps they might be interested in a single-player or two-player choice. Backgammon, Chess, and Checkers are typically played in two, as well as Mahjong and a variety of other such choices. Try to think ahead and decide whether it might be awkward for two people to play something in one corner of the room while the rest of the crowd is playing something else. How creepy can things get? As we were saying, some people have a unique sense of humor. That of some individuals can be dry, while that of others can be downright macabre. If you’re into such games, be sure to consider choices like Gloom, Superfight, Poop, Cards Against Humanity, Exploding Kittens, Drunk, Stoned, or Stupid, and various others. If you don’t have any friends of this kind, although most of us do, you might want to try classics like an Ouija Board, Clue, Monopoly, Scrabble, Risk, and The Game of Life. The Ouija Board is one of the most popular games in the world as many people like to be a bit creeped out at spooky gatherings. It’s a great option if you’re looking for means to have fun on Halloween, for instance. Does it need to be a storyline? Some games are way more creative than others, which is to say that one of the players becomes a character and we follow his or her adventures throughout the game. The Game of Life is one of such examples, as it simulates the journey of a person through various milestones such as going to college, getting a job, getting married, and even having kids. Of course, you need a bit of patience if you’re going to stick to all of these achievements, even in your life, not just the one of your character. So, if you don’t have a lot of time to spare, such an alternative might not be feasible. These options have acquired a good deal of appreciation over the years. One of the best-known games in this line is the Settlers of Catan. The coolest thing about this alternative is that it doesn’t require anyone to become a particular character. All you have to do is gather resources so that you occupy as much land as possible by creating roads, castles, and a variety of other buildings. Another such game is Mystery of the Abbey, which seems to be somewhat similar to Clue. In order to be able to solve a mystery, the players have to move a monastery around so that they can find clues. By asking certain questions, you can get some pointers as to how a character looks like, whether they are wearing a hood, have a particular title, or anything else. There are many choices coming out every year, which makes the whole decision-making process a bit tedious for any prospective buyer. That’s why we suggest you take some hours of your time and do a bit of research. Go through as many party games as your time allows you to because you will be able to come across a plethora of opinions. It goes without saying that you need to keep an open mind while reading the reports coming from other people, because they may not have the same tastes and preferences as you do. Last, but not least, you should go online and check out social media websites like YouTube. There are vloggers who do reviews of games, and the internet is packed with such videos. Who knows when you might find something you like?